Vanaf aanstaande vrijdag, en dat is morgen dus al, kun je van de officiële Sims 3 sites een trail downloaden en zo Sims 3 al spelen. Of dit een trail is van het spel zelf of van Create a Sim is niet bekend, de trial zal ook op de Sims 3 pagina van Facebook te vinden zijn. Wat morgen ook online komt is Sim Friend: op de Sims 3 site kun je dan uit 120 karakters een ‘pen pal’ kiezen en via email met deze Sims 3 karakters communiceren. Sim Sidekick is de derde manier waarop EA en Maxis het spel gaat promoten aan mensen die Sims nog nooit gespeeld hebben. Je kunt dan uit 6 karakters je favoriete kiezen en die volgt dan al je activiteiten in je internet browser en reageert op de websites die je dan verder bezoekt. Ik heb geen idee of deze trial download via de EA Download Manager gaat: misschien is het goed die nu al even op te starten want ik kreeg gisteren een nieuwe versie binnen: EA Download Manager 5.0 (zie ook dit blogbericht). Zodra wij meer weten over deze trial en wat je precies kunt spelen, Sims 3 zelf, alleen een klein deel van het spel of alleen CAS of iets anders, meldden we dit natuurlijk meteen. In its biggest campaign yet for its biggest franchise, Electronic Arts is making The Sims video game a little more sociable. The Sims lets players choose characters and create lives for them, selecting everything from when they sleep to what their bathroom looks like (“Sims” is short for “simulated”). Introduced in 2000, and updated in 2004, it became the best-selling line of PC-based video games in the world. In The Sims 3, which goes on sale June 2, there are new features. Previously, players could choose what Sims looked like; now they can choose their personality traits — neurotic, vain, loves to cook and so on. “What they want from life is determined by their personality traits,” said Benjamin Bell, the game’s executive producer. “We really felt like the ability to create human beings, to give them a soul if you will, was really exciting, so we wanted to come up with some ways that people could define the personalities of their character,” Mr. Bell said. And while the characters lived in a single household in earlier versions, they now live in a town. The game supplies characters that also live in the town, but players can create new citizens, change the existing ones, or remove them and replace them with, say, replicas of the cast of “Lost” to see what it is like to live next door to them. Electronic Arts executives wanted the marketing campaign to showcase the new features of The Sims 3, and to get people who might not play the game to understand what it was about. The focus of the marketing is online, and beginning Friday, Electronic Arts will begin offering three ways for consumers to play with Sims characters on the Web. There will be a free trial available at Sims3.com and at the Sims 3 fan page on Facebook, meant for people who have never played the game before. Another option, called SimFriend, lets visitors to the Web site pick a Sim pen pal from among 120 characters, and that pen pal will send e-mail messages. For example, a Sim might send a message asking what type of dinner she should cook for her boyfriend, and the fan picks from options like “Cook an elegant meal.” The e-mail chain would continue, tailored to the Sim’s personality and skills. “If the Sim happens to be a kleptomaniac chef, the response you get back might be, ‘Thanks, I went and stole food today,’ when what you’re expecting is ‘Thanks, I just had lunch,’ ” said John Buchanan, senior director of worldwide marketing for the Sims line at Electronic Arts. 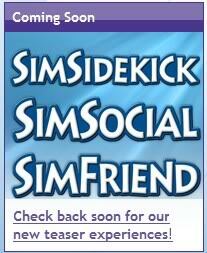 The third option is called SimSidekick. A fans chooses from 6 characters on the Web site, and an image of the character that is chosen floats on top of the browser as the fan moves around the Web. The character has site-specific responses to sites that Electronic Arts has chosen, like MTV.com, YouTube, and Twitter. On Twitter, for instance, where the mascot is a bird, a flock of bluebirds descends on the character, and, depending on its personality, the character will jump, wave his or her hands, or respond in some other way. On other sites, the SimSidekick software looks for the category of the Web site, like travel or news, and the character responds appropriately, acting like a sports fanatic on a site like ESPN.com, or looking like he’s searching for something on Google.com. The effort is reminiscent of what Skittles, the Mars candy brand, did this year with its Web site, showing a floating Skittles graphic on top of the browser that took visitors to the brand’s photos on Flickr or product pages on Facebook. 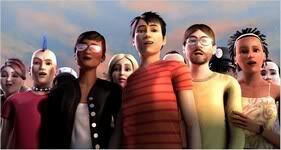 Sims characters will also come to life on the Viacom sites MTV.com, VH1.com and AddictingGames.com, a game site, on June 2. Characters will move around text and graphics on pages of the sites. The game will also be promoted through an iPhone sampler application, available now (the full game will be available for purchase and play on the iPhone or iTouch on June 2; a Macintosh version will also be available then). Freestyle Interactive in San Francisco, part of the Isobar division of Aegis, worked on the digital advertising efforts. But measuring whether these efforts are a hit or a flop is a challenge for Electronic Arts, which, like other marketers, hasn’t quite determined how to assess social media advertising. As Microsoft marketing executive Mich Mathews said at the annual 4A’s advertising conference last month, a result like 100,000 views of a YouTube video doesn’t mean very much. “I would confess, though, we look at it: ‘Is that a good number or not a good number?’ ” she said. Mr. Buchanan said that Electronic Arts would look closely at Web site traffic, advance sales and game sales, along with monitoring how consumers were reacting to the game in online discussions. “We’ll be able to get closer to measuring what’s working and not working, but there’s still a little bit of art in identifying performance in the new media space, versus being all science,” he said. “It’s referring to the fact that there are almost little people that live in your computer, and because of these new personalities and traits, they have a life of their own and do what they want,” said Aaron Allen, a creative director at Wieden + Kennedy, which created the print and television ads. One TV ad shows a house on fire and people stealing a television — to appeal to the subset of Sims players known affectionately as deviants — and then, for the romantics, a couple finding one another. “The Sims is all about the characters, and it’s characters that are written into the game and characters you create, and every interaction you have, you get a different response,” said Ian Schafer, the chief executive of the digital-marketing firm Deep Focus, which did not work on the campaign. “That’s the beauty of the game, and that’s the beauty of the campaign,” He said. Holy Moly dat wordt een drukke dag morgen: teamleden op de Sims 3 sneak preview in Utrecht en ik thuis Sims 3 trial spelen en over berichten.